I'm just glad the 5-1 loss happened to Spain and not Brazil, could you imagine the rioting? Who's up for Australia v Chile? Do you think Costa could get retrospective action for his headbutt? Perhaps AR, although that scoreline is punishment enough, surely? 3 Games in and already this World Cup has been amazing. Thank you Soccer Gods!!!! I'll be right here with you bristolian. What will Vicente del Bosque have made of that, then? The Dutch score some pretty nice goals every tournament. Last WC there was Gio's. This year RvP and more to come! It's time for the Orangemen, all the way to the cup final and a Victory! The question is who is not watching. I'm watching all the WC games! Same tactic, pretty much the same team, playing for almost a decade.... it would be naive to think people haven't got them all figured out? I thought last year's confederations cup failure would have been a wake up call, apparently not. Tom, what stereotypical underdog team do you give the best chance to shake things up a bit this Cup? Cory, of course the Belgians (who are near-favourites anyway). Other than them, I think Japan or Ghana could go quite far. 3 games in and average of almost 4 (3.67) goals per game.. cant get any better than this can it? I'm supporting Germany all the way, but I'd be happy to see Netherlands win their first Cup. Zach - Suarez is unlikely to start - check out our story here. Chris C - with Suarez fit, they could surprise everybody. Without him fit they've still got a chance, but he is key. HALF AN HOUR UNTIL AUSTRALIA VS CHILE! Both Vidal and Alexis start for Chile! That goal diff may hurt spain. The Australian national anthem rings out and we're moments away from kick-off - predictions? Spain seem to be in love with their legends and/or players who have more experience, than going with whose performing now. I say all this with limited observation. I thought Alberto Moreno should have started too. Wish Chelsea didn't get Costa.....I'm in the Blues. Another pure No. 9?, no me gusta. Apologies Cory, but you're always welcome here! Great contribution today. I have heard good things about GK Ryan in Australia. Perhaps a player whose name we will hear a lot over the next 90 mins. 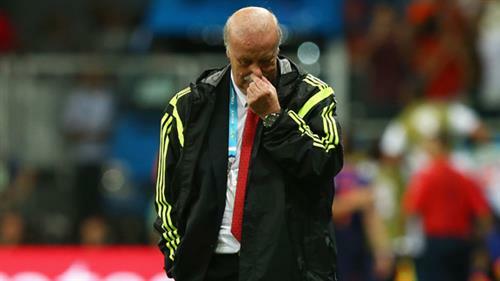 Puyol retired , David Villa and Iker Casillas have been in bad for ever since they got injured , Spain have no world class attackers , Players are getting older , Defense is lacking confidence , this isn't the same Spain from 2012. . .